The splendid Valley of Flowers is located about 11 km from Gobindghat. The glacial corridor is about 16 sq. km. 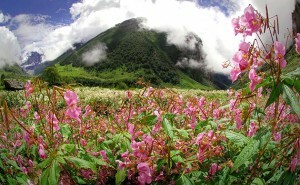 The Valley of flowers is truly, the valley is carpeted with wildflowers during the monsoon season. The valley becomes really colorful during July and August. It seems the valley is painted with so many colours during the season. Many species of flowers like Himalayan blue poppy, the uncommon varieties of primrose and orchid are fascinating to the visitors. This entry was posted in Flowers Valley National Park, Uttaranchal and tagged florist flowers, flowers delivery, mountain valley, National Park, Valley of Flowers. Bookmark the permalink.